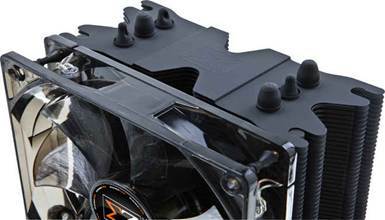 The Xigmatek Stealth series coolers make use of advanced ceramic materials originally pioneered in the high-tech aerospace and automotive industries. The ceramic coating features high strength and light weight and is specially formulated for maximum thermal conductivity making it well suited for use in extreme temperature environments. 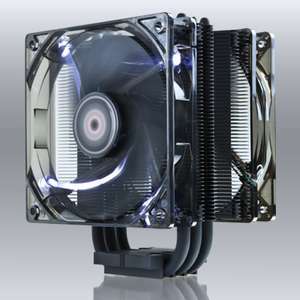 The Xigmatek Dark Knight SD1283 is the world's first enthusiast cooler to utilize a modern ceramic coating and was the result of Xigmatek thermal engineers thinking outside the box. Xigmatek's innovative use of this space age material is not just for good looks - the ceramic coating along with Xigmatek's patented HDT technology greatly increases the efficiency of thermal transfer away from your CPU. High Thermal Conductivity - The increased thermal conductivity of the ceramic coating rapidly absorbs and removes heat from the CPU via the heatpipes. 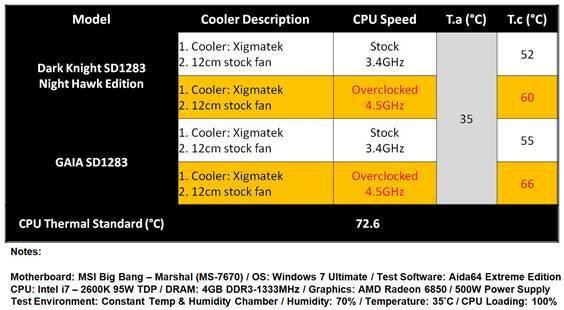 Increased Cooling Area - Traditional aluminum fins are not as effective conducting heat at the outer edges. The ceramic coating allows heat to rapidly spread over the entire surface of the cooling fins, reducing thermal hotspots and increasing the cooling area. 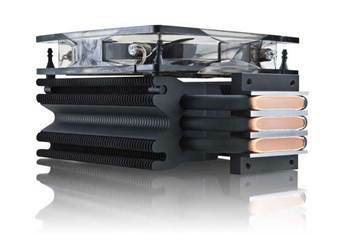 HDT - Xigmatek's use of superior grade copper for the patented Heatpipe Direct Touch technology places the performance enhanced heatpipe directly against the hot CPU, increasing the effectiveness of removing heat from the source. The Dark Knight SD1283 features a high-tech and stealthy matte black ceramic finish and is mated with a matching smoke black fan, giving it a unique presence. The effectiveness of the ceramic coating allows for reduced width fins resulting in an ultra-slim profile making the Dark Knight SD1283 well suited for either single or dual fan (push - pull) configurations that easily fits within the physical constraints of modern motherboard designs. 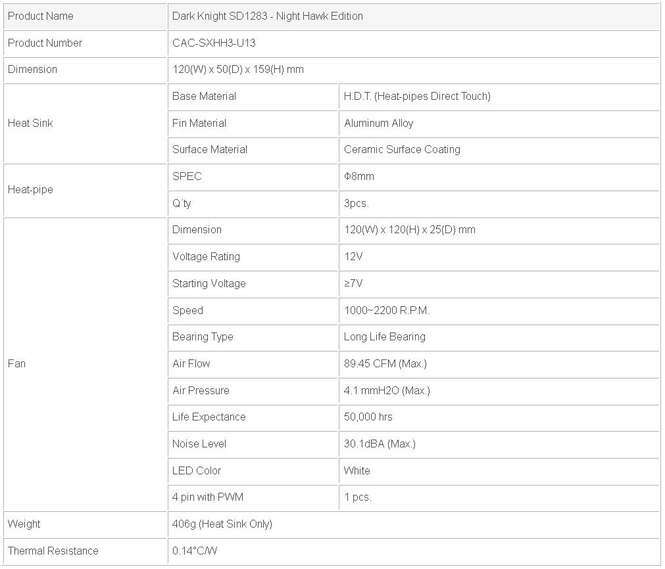 Performance testing between the similar Dark Knight SD1283 (ceramic) and GAIA SD1283 (non-ceramic) coolers indicates a performance increase of of up to 10% under stock and overclocked CPU speeds. Xigmatek leads the market by continuing to innovate in cooler design while the competition is satisfied with rehashing the same old technologies. Xigmatek was first to market with HDT and is now first to market with the use of advanced ceramic materials. Xigmatek: We Innovate. H.D.T (Heat-pipe Direct Touch) technology. Stealth Technology; Low Heat Signature Ceramic Coating, larger heat dissipating area. Equipped with multiple clips to support Intel LGA 2011 / 1366 / 1156 / 1155 / 775 and AMD FM1 / AM3 / AM2+ / AM2. High Performance 3 x 8mm heat pipe design, way superior than 4 x 6mm heat pipe. Pros: over 3 years with this and it handled my i7 920 2.67ghz oc'd to 3.45ghz all that time. Just switched out for an h105 corsair but for air this thing worked well. 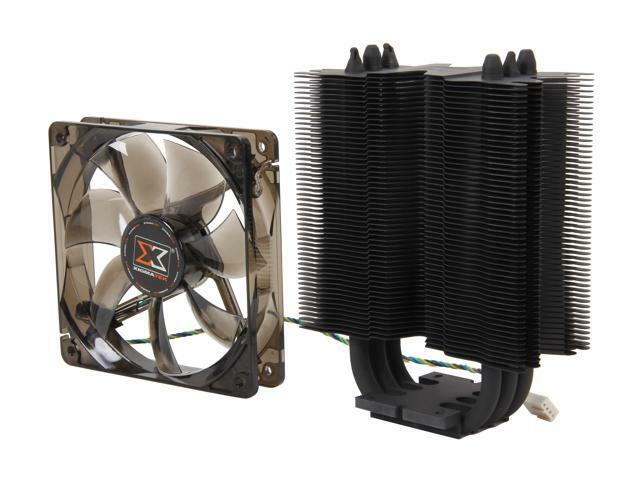 Other Thoughts: Ever want a cheap cpu cooler and can find one cheap? get it, they work. Pros: After years of use this cooler still does exactly what it advertises, all while looking cool (no pun intended) and being easy to install. I had no particular issues installing this component. My AMD FX-6300 always idles at 18 °C. Under load or during stress testing my temps only get up to a stable 28 °C. Price was nice as well. Other Thoughts: I installed two fans on the heat sink: one pulling air into the manifold and another on the back pulling air out of the manifold. From there it dumps it's exhaust air four inches in front of a case fan which pulls the air out of the case. Pros: Let's face it, one of the main reasons I bought this was because it looks awesome. I loved the feel of it when I took it out of the packaging and placed it in. It does well for cooling, at least I've never had an abnormal problem with it. Even when I CPU mined a little and would leave it on for a few days it worked really well. Cons: My two issues are that the rubber fin mounts are hard to slide into place and as such I bent some fins. Also, and my main issue, the fan is annoying. It's not terribly loud and obnoxious, but you can definitely hear the thing. I have a Corsair 300R case and due to the mesh on top, you can hear it. Pros: Coolers my CPU better than my H100i and this is much cheaper and quieter. Cons: Should have made the base black as well the chrome matches nothing in my rig. Fins have to be bent to install fan with rubber screws, Mounting is weird but hey it works.